A great new alternative to sandwich packaging has just arrived! Gator Papers custom printed sandwich bags are the perfect packaging alternative for your food service needs. We offer a full line of durable, high-quality Sandwich Bags in an assortment of colors and sizes. With our high color print technology we provide custom printing and hot stamping for added brand recognition to your bags. Don’t forget to check the complete line of restaurant supply products Gator Paper has to offer. Our website provides detailed information on every product in our food packaging supply line. Whether you need sandwich bags, clear plastic cups, beverage napkins, paper bags, French fry scoop cups, custom printed Kraft paper, hot food cushion foil paper, candy bags or something more, we have everything your business needs to be a success. Personalized packaging is just one of the ways Gator Paper brings quality promotional products to all their customers. Durable, high-quality Sandwich Bags in an assortment of colors and sizes. Custom Printing with high color print technology! 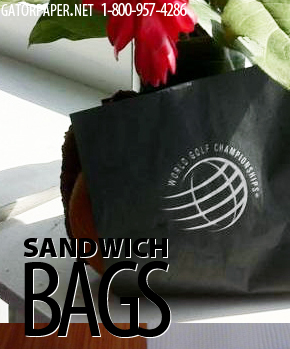 The custom printed sandwich bags are available to order in a variety of shipment sizes. The minimum purchase size is 1,000 bags. With small compact ordering sizes you can reduce the need for more storage. Call or chat online with one of our customer service representatives for more information on filling your order today!